At home in both Tokyo and Vancouver, Jasmine Oshima is a Japanese Nailist Association Certified nail artist. After training in Yokohama, she set out to bring Japanese nail art to the rest of the world and created Neiru, a nail art website where online workshops are held to teach subscribed members the latest in Japanese trends, techniques, and styles. Through virtual classes, Oshima is empowering nail artists to create their own unique designs, she says. Follow these steps to learn how to execute a watercolor flower. 1. 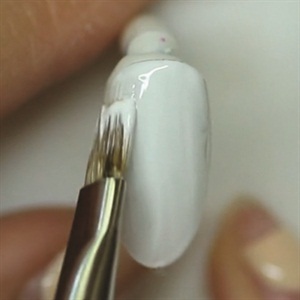 With the gel-polish base coat already applied to the nail, apply a white gel-polish as the base color and cure for 30 seconds under an LED light. Apply a second coat and cure. Apply top coat and cure. Wipe the entire nail with alcohol and gently file the surface using a 180-grit nail file. 2. 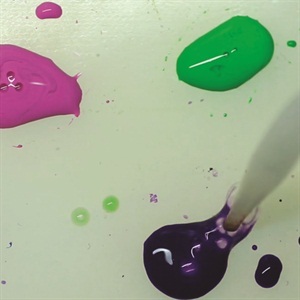 Place pink, green, blue, and purple acrylic paint on a mixing palette. Add a drop or two of water to each color to dilute it. 3. Use a pointed art brush to create petals by dropping the diluted pink acrylic paint in a petal shape. Try not to place perfect dots in order to avoid a perfectly round shape. 4. Wipe your brush clean and make sure it’s slightly dry and place it over the drop of pink acrylic paint so that it absorbs the extra water and leaves the watercolor effect. 5. Repeat steps three and four to create the rest of the flower with all of the colors on your palette. 6. Add dimension to the design by adding falling petals repeating steps three and four. 7. Use a liner brush and gold glitter gel-polish and place it on the center of the nail and anywhere else there is open space. Cure. 8. 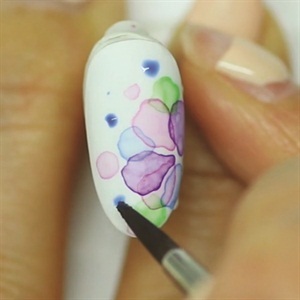 Place gel-polish top coat and place in on the center of the flower and place a crystal on top of the gel-polish. Cure. Coat the entire nail with top coat for extra shine. Cure. To see more of Oshima’s step by steps, visit www.neiru.me.